The Bosch Rotak lawnmower has been a familiar favourite amongst corded lawnmower users, but of more interest to us is their cordless top dog 43 LI variant that champions all the Rotak design and features but without the trailing power cord. So is it the obvious and improved evolution to the line for £449 with the battery, charger and mower all in? Set-up was a tool free matter. All that’s required is to join the handle system and clip the grass box together. The wheels, blade, body shell and everything else are pre-assembled and the battery is pre-charged - so it’s an almost instant start to proceedings. We count ourselves fans of the soothing green body and curious contrasting silver muscular American truck styled front panel design. It does stand out amongst the crowd; looking unmistakably futuristic, helped more so by the lack of a cord. Something we immediately became accustomed to on the Rotak was the QuickClick folding handle - collapsible in seconds by unclipping either side - and this mechanism doesn't scratch the handle's paintwork either. 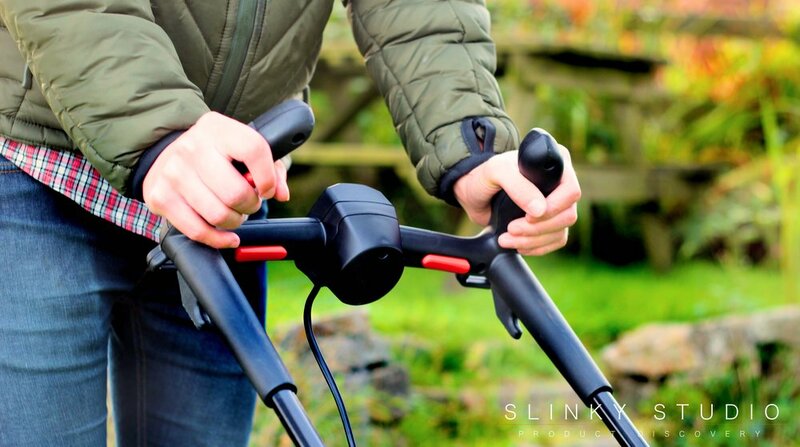 On the main body is a separate carry handle making light work of carrying the 14kg mower up steps or over gravel pathways - in fact, it’s the lightest cordless mower we’ve reviewed! It takes up a conservative amount of garage or shed space, despite a wide cutting width of 43cm. (Which incidentally eclipses the 38cm Black & Decker and 36cm Einhell Power X-Change GE-CM cordless lawnmower widths. In comparison it runs closer towards the enormous self-propelled Cobra MX46S40V cordless lawnmower's cutting width of 48cm but in a compact design - impressive!) Furthermore a 50 litre grass box has been supplied - which is large for the mower's size, but this is accomplished because the box is taller and more contoured than most thus leveraging all the space it can sensibly consume. 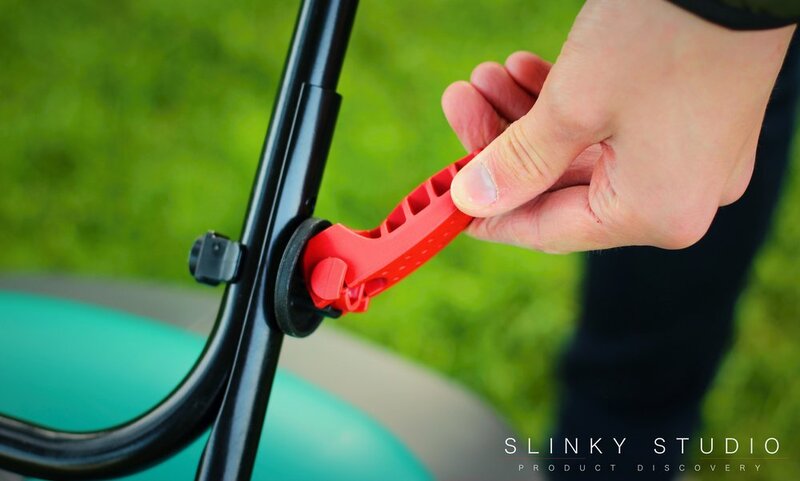 Something that could be improved is the quick release cutting height adjustment lever located on the left side of the mower, adjustable between 20–70mm in height - strangely we found it harder to manoeuvre than other brands of cordless models. There’s a few unique features the Bosch Rotak 43 LI has that we haven't seen within the cordless sphere yet. The first appears to be a deliberate appeal to the UK lawnmower market that is obsessed with stripes! 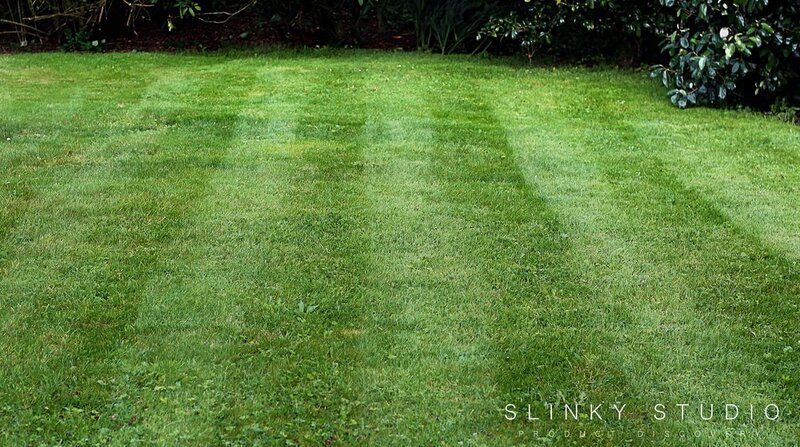 For whilst it’s true the introduction of brilliant robot mowers like the Robomow have diluted our love affair with stripes for a no-work clean cut, we can’t help but enjoy the look of a tidy striped lawn - it accentuates the size too. What Bosch have done is to mount onto the front of the mower what they refer to as grass combs. These are intended to help mow right to the edge but the byproduct is opposing directional stripes - we reveal how well it works later on. Another unique self explanatory introduction is LeafCollect - it's a steel blade assembly calculated to generate a stronger airflow, although thankfully the rest of the body is made from much lighter and hard wearing plastic. Seriously, we’ve crashed our Bosch into rocks, grazed it against fencing and, of course, it’s spent a fair bit of time underneath scratchy hedging: the outcome is that at the end of every mowing cycle we’re always surprised by the resilience of the plastic shell. And from our eclectic experience of cordless mowers with plastic bodies they generally provide longevity after years of weekly cutting. Every cordless lawnmower we have ever reviewed has been supplied with 2 batteries and it therefore seems understandable that the lone battery supplied with our variant of the Bosch Rotak 43 LI cordless lawnmower had us anxious regarding wait times during charging intervals. 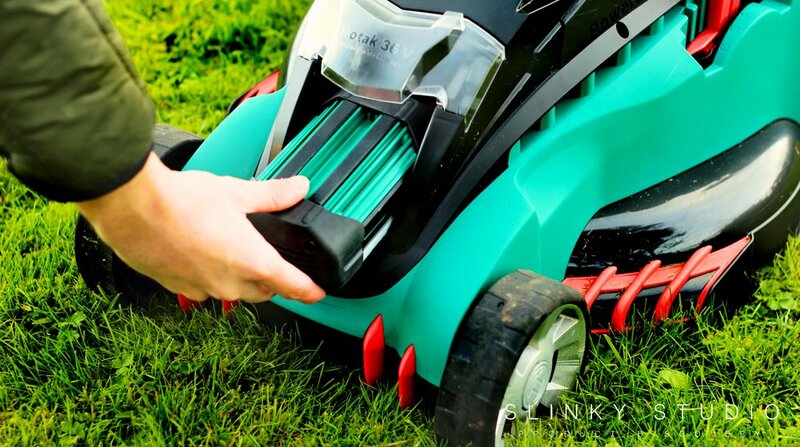 After testing, our anxieties turned into great delight when we witnessed the longevity of charge from the Polish made 36v 4.0Ah battery - wait times did not come to reality when cutting our lawns. We have extracted a consistent 50-55 minutes of cutting time thanks to the clever Syneon Chip that leverages performance ratios between electric current and voltage to the output of the motor according to what the application demands. To put these runtime figures into perspective, the single Bosch battery density outruns both the Black & Decker and Einhell offerings that have a span of cutting time between 35-40 minutes from 2 separate batteries combined. The only other cordless mower we’ve reviewed to attain similar battery runtimes is the Cobra MX46S40V mower, but again it has 2 very large batteries to power a self-drive function that eats into the battery when enabled. For most domestic lawns the 55 minutes is an abundant runtime, but if you desire a longer runtime then we’d recommend purchasing another battery - pricing varies between £85-£164 depending on the capacity. This is because once the battery has been used to capacity it takes around 2 hours to fully recharge. No doubt the charger is rebalancing the cells as well as charging but this is a lengthy time to wait. We’ve been pushing the Bosch up steep inclines, over bumpy lawns, flat lawns and there’s also some congestion of obstacles to get around too. Pushing the Bosch along our flat lawns is a fairly straightforward affair and the handlebars, with their dual grip/button zones as seen within our above photos, make hand fatigue something that can be controlled. Pivoting the mower at the end of each line of run is not a demanding task due to the solidity of the handlebars keeping the mower well balanced. Tracking around trees and flower beds feels easy to control too. We’ve even used the Rotak 43 LI as we would a trimmer on a few occasions alongside a pathway, cutting narrow 30cm verges either side with just the lefthand wheels tracking, and it was a doddle to balance whilst we achieved tidy pathway grass edging. Now, something we’ve noticed is that the unique rubberised wheels seem very grounded and, when this effect is combined with the forward mounted grass combs, the front end grips downwards. So, because our pushing power is at the rear, we’re marginally pushing against this downwards force, making mowing a little more tiresome in comparison to the previously mentioned Black & Decker and Einhell models. However, this is a very small amount of extra energy needed and we think worth it for the stripes and exceptional evenness of the cut on flat lawns. Nevertheless we have to warn those with severely hilly lawns, some of which we have here at the studio - of a rather large size we should add - that we’ve discovered the hard way it’s a real workout for the arms and back. Obviously the lower the cut, the harder the push. It’s not unbearable, just something to keep in mind if you have large lawns like us that require a good 50 minutes of cutting. You could be forgiven for thinking that because the battery extends to such a long runtime the Rotak 43 LI lawnmower, with its Syneon Chip, could potentially try too hard in its cause to preserve energy and thus produce a frugal performance, but this is not at all the scenario. In fact, the Bosch Rotak 43 LI is fierce in the cutting power it presents - whizzing through thick 2cm branches, tree bark and in one instance severely overgrown 20cm high grass was sliced through without any hesitation from the motor. The Powerdrive LI+ motor system doesn't fade and we’ve only had it cut out when we accidentally left the cutting height on the lowest setting allowing the blade to ground. We usually stay on level 5 when selecting from the 7-level height adjustment settings ranging between 20–70mm. One benefit of testing a lawnmower at this time of the year is that we can utilise its vacuum abilities and see how well it can whisk up the littered leaves, pine needles and branches from our autumnal lawns. This is where that sticky feeling when pushing the mower becomes a useful element, because with just one pass we glance over a shoulder to see a completely clean lawn: this is on a meticulous level we’ve never previously witnessed, thanks to a tight seal with the ground and the front mounted grass combs disturbing debris for quick consumption. Furthermore the quality of grass cut is silky, concise and full. The latter aspect is a new one for us, the reason being that the grass combs encourage the grass strands to stand tall after cutting. Uniquely the blade has sharp edges and this definitely works well, especially when cutting lawn edges. The grass combs, as demonstrated by our photos, have produced stripes when looking down the lines. When viewed sideways the effect is weakened but still perceivable - nonetheless a roller is still the proven champion of stripes. Moving onto our hilly lawn, our photo below demonstrates the smoothness of cut over different terrain heights, and this lawn was plagued with pine needles, leaves and small twigs before mowing too. If needed, the collecting box can be removed and the redistribution or mulching of trimmings onto the lawn is possible, and it is quite effective in hiding/embedding the shorter cuttings when used like this. In one light, the Bosch Rotak 43 LI is the best cordless lawnmower offering we’ve reviewed to this date. It’s the lightest cordless mower we’ve used, has an easy to fold lightweight design, is quiet in operation, creates stripes, has a really impressive lengthy 55 minute runtime (with the 4.0Ah 36V battery), has high torque power that blasts through thick twigs, etc. and, as we’ve also discovered, it’s an excellent lawn vacuum cleaner in the autumn and winter months. 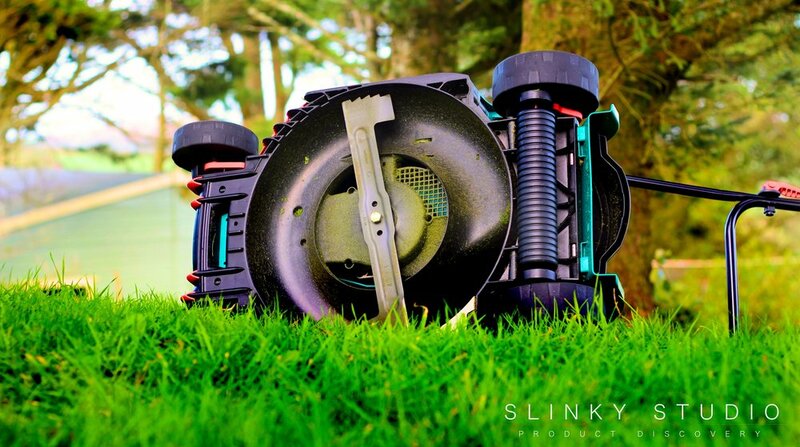 On the negative side of things the design encourages a gripping profile against the ground, making it a bit harder to push than other cordless mowers we’ve reviewed on flat lawns and a reasonable strain on sloped ones. Yet this character is what unleashes its excellent cutting attributes, the byproduct of which is a shimmery evenly cut lawn with striping and no leaves or debris.